Born on August 4, 1970 in Crown Heights, New York, Hakeem Jeffries is the nephew of CCNY Black Studies professor Leonard Jeffries. He earned a BS in political science at SUNY Binghamton in 1992, an MA in public policy at Georgetown University in 1994, and a JD at New York University Law School in 1997. In the early ’90s, Jeffries was employed in the office of Washington, DC mayor Sharon Pratt Kelly. He subsequently clerked for federal judge Harold Baer (Southern District of New York) in 1998; was an associate at the New York law firm of Paul, Weiss, Rifkind, Wharton & Garrison from 1999-2003; worked as the litigation counsel for Viacom and CBS from 2003-06; and served as a Democrat in the New York State Assembly from 2006-12. During his years in state government, Jeffries favored race-based affirmative action preferences in public college admissions and public-sector hiring; supported increased government spending as a means of promoting economic growth; condemned what he called “the systematic civil rights abuses that result from the NYPD’s stop-and-frisk program,” which he viewed as racist; advocated alternatives to incarceration for nonviolent offenders; co-sponsored a Student Loan Fairness Act that advocated loan forgiveness to borrowers who made 120 monthly payments over the course of 10 years; maintained that citizens should not be permitted to carry concealed firearms; and called for the transformation of vacant luxury condominiums into “affordable homes” for low-income families. Shortly before the decennial U.S. Census in 2010, Jeffries joined forces with Al Sharpton and State Senator Eric Schneiderman in an effort to end what they termed “prison-based gerrymandering” in New York State. Their goal was to require the state to count incarcerated persons as residents of their home communities—rather than of the locales where they were imprisoned—for purposes of tabulating the Census data upon which legislative district lines (and the districts’ respective levels of political clout) would be based. In Jeffries’ view, this was particularly important for communities with large black populations, given the disproportionate degree to which African Americans are incarcerated. Click here for a more detailed explanation of this issue and its ramifications. In 2012 Jeffries was elected to the U.S. House of Representatives, where he continues to represent New York’s heavily Democratic, majority-black, 8th Congressional District covering sections of Brooklyn and Queens. He is a member of both the Congressional Black Caucus (CBC) and the Congressional Progressive Caucus (CPC), and has received strong campaign support from the Working Families Party. On October 27, 2013, Jeffries and fellow CBC member Yvette Clarke were among the guest speakers at a Civic Engagement Banquet arranged by the Muslim Ummah of North America (MUNA), which describes itself as a “faith-based Dawah [proselytizing] and social service national organization.” The Muslim Brotherhood, in some of its documents, mentions MUNA as one of its component groups. In January 2014 Jeffries was one of 13 House Democrats who co-sponsored a bill requiring a government agency, the National Telecommunications and Information Administration, to study how hate speech on the Internet, mobile phones, television, and radio may “advocate and encourage violent acts and the commission of crimes of hate” against “vulnerable individuals.” “This legislation will mandate a comprehensive analysis of criminal and hateful activity on the Internet that occurs outside of the zone of the First Amendment protection,” said Jeffries. Jeffries was angered by a Ferguson, Missouri grand jury’s November 2014 decision not to indict a white police officer who had shot and killed an 18-year-old black male named Michael Brown in an August 9th altercation. Despite the wide circulation of wholly fraudulent reports suggesting that Brown had been shot while his hands were raised in compliant surrender, the physical, forensic, and legitimate eyewitness evidence showed conclusively that the young man was in fact shot after he had assaulted the officer and tried to steal his gun. On December 1, Jeffries took to the House floor to display the “Hands Up, Don’t Shoot” gesture that had become symbolic of a massive anti-police-brutality protest movement stemming from Brown’s death. He characterized the gesture and its accompanying slogan as “a rallying cry of people all across America who are fed up with police violence” and with “the injustice involved in continuing to see young, unarmed African-American men killed as a result of a gunshot fired by a law-enforcement officer.” “This is a problem that Congress can’t run away from,” Jeffries declared. In 2013 Jeffries co-sponsored the Minimum Wage Fairness Act, which called for raising the minimum wage for workers nationwide to $10.10 per hour. That same year, he voted against maintaining a work requirement for welfare recipients. With the Democrats having recaptured control of the House of Representatives in the 2018 midterm elections, Jeffries became Chairman of the House Democratic Caucus in January 2019. For an overview of Jeffries’ voting record on an array of key issues, click here. For additional information on Hakeem Jeffries, click here. 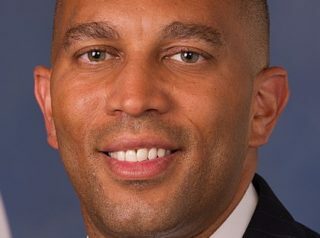 Further Reading: “Hakeem Jeffries” (Keywiki.org, Votesmart.org, HakeemJeffries.com, OnTheIssues.org); “13 House Democrats Offer Bill Demanding Government Study on Internet Hate Speech” (1-17-2014); “Rep. Hakeem Jeffries Brings ‘Hands Up, Don’t Shoot’ to House Floor” (Washington Post, 12-1-2014); “Politicians Speak Out After Non-Indictment in Garner Case” (Breitbart.com, 12-3-2014); “NY Dem: ‘Every Racist in America Voted for Donald Trump’” (Fox News, 6-13-2017); “Jeffries on Wall: Dems Will Not Pay Trump’s ‘Ransom Note’” (Breitbart, 12-30-2018); “Democratic Congressman Calls Trump ‘Grand Wizard of 1600 Pennsylvania Avenue’” (CNN, 1-23-2019).